Heat oven to 425°F. Spray two 17x12-inch half-sheet pans with cooking spray. Place zucchini in single layer in pans. Sprinkle with 1/2 teaspoon of the salt. Bake 20 minutes or until almost tender. Reduce oven temperature to 375°F. Meanwhile, pierce potatoes with fork. Place potatoes on microwavable paper towel in microwave oven. Microwave uncovered on High 6 minutes or until partially cooked. Cool 10 minutes. Peel and thinly slice potatoes; set aside. In 12-inch nonstick skillet, cook beef and onions over medium heat 8 to 10 minutes, stirring occasionally, until beef is thoroughly cooked; drain. Stir in wine, tomatoes, tomato paste, 1 teaspoon salt and 1/4 teaspoon of the pepper. Heat to boiling; reduce heat to low. Simmer uncovered 7 minutes, stirring occasionally, until most of liquid is absorbed. In 2-quart saucepan, melt butter over medium-low heat. Stir in flour and remaining 1 teaspoon salt and 1/4 teaspoon pepper. Cook, stirring constantly, until mixture is smooth and bubbly. Gradually add milk, stirring constantly, until mixture boils and thickens. Stir in rosemary and garlic. Spray 13x9-inch (3-quart) glass baking dish with cooking spray. Spread half of the meat sauce in baking dish. Top with potato slices. Place half of the zucchini slices over potatoes; sprinkle with 1/2 cup of the cheese. 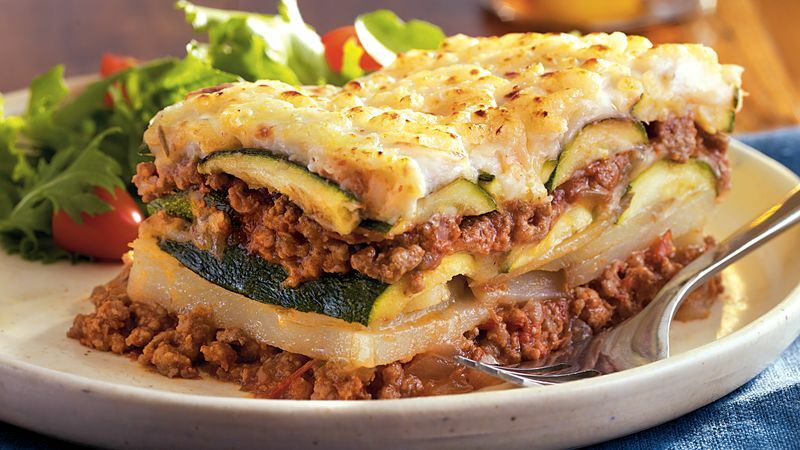 Repeat layers with remaining meat sauce, remaining zucchini and 1/2 cup cheese. Pour white sauce over top. Sprinkle with remaining 1 cup cheese. Bake uncovered 45 to 55 minutes or until top is golden brown. Let stand 10 minutes before serving.